Dan Gilbert, the founder of Quicken Loans Inc. and owner of the Cleveland Cavaliers basketball team, and AT&T Inc. each bid about $5 billion for Yahoo Inc.’s core business, patents and real estate assets, people with knowledge of the matter said. Verizon Communications Inc. made an offer between $3.5 billion to $4 billion for only Yahoo’s core business, according to two people familiar with that situation, who asked not to be identified because the information is private. At this time last year, the industry was riding high as China’s stock market soared, volumes jumped to records and some of the biggest names in finance boosted hiring. Now, turnover is shrinking at the fastest pace since at least 2006 and banks are under growing pressure to either downsize their Asian equity desks, or exit parts of the business altogether. The Basel Committee on Banking Supervision is considering a series of rule revisions as part of their effort to finalize postcrisis capital rules. Regulators agreed to spend this year addressing weaknesses spotlighted by the financial crisis, including minimizing the variance in how banks weigh their own risk in three key areas: credit risk, market risk, and operational risk. Producer Adam McKay of “The Big Short” fame has gotten the “Hunger Games” star to sign on to play the 32-year-old Theranos boss, whose fall from grace to the silver screen could not have been quicker. Her medical testing company was worth about $9 billion a year ago. But it has been mired in controversy since an explosive report questioned the effectiveness of its blood-testing system, and the company is in the midst of several federal probes. It isn&apos;t clear what&apos;s on the menu, but an anonymous bidder paid $3,456,789 to have lunch with Berkshire Hathaway CEO Warren Buffett as part of a charity auction on eBay. Bidding for Buffett&apos;s annual "power lunch" charity auction closed Friday after a week of escalating offers. Bidders were required to prequalify with a pledge of $25,000. The beneficiary is Glide, an organization that assists homeless people in the San Francisco Bay Area. Buffett pledged he will dine with the winner and up to seven guests at Smith & Wollensky steakhouse in New York City on a mutually agreed upon date. Libya&apos;s $67 billion sovereign wealth fund will go head-to-head with Goldman Sachs in London&apos;s High Court this week over claims that the U.S. investment bank exploited the fund by encouraging it to make risky and ultimately worthless investments. In what will be one of the most closely watched cases in the City of London, the Libyan Investment Authority (LIA) is attempting to claw back $1.2 billion from the Wall Street giant from nine disputed trades carried out in 2008. Lotte Group indicated it will shelve what may have been a $4.5 billion initial public offering for its hotel unit, the world’s biggest so far this year, after widening investigations pushed the South Korean conglomerate deeper into crisis. 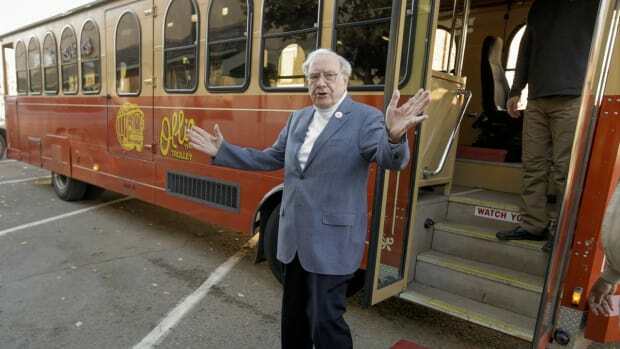 Warren Buffett hates investment bankers, loves Ajit Jain and Greg Abel; Citi CEO might get to keep his job, might not; Dennis Kozlowski is a free man; Wall Street burger club; Cap'n Crunch Donut Holes; AND MORE.